More than year after the killing of Burhan Wani, film-makers in Pakistan had come up with an animated version of the the rebel whose killing brought the entire region to an absolute stand still. It appears that the video has been removed from YouTube, and the official account suspended. 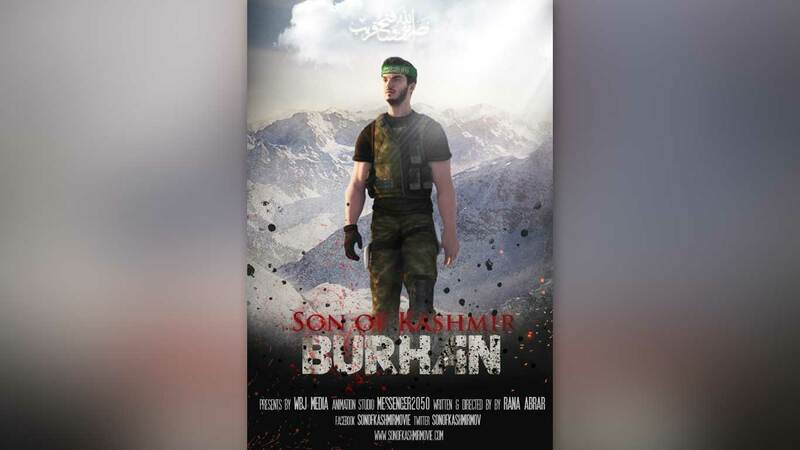 Earlier, the teaser of the animated movie titled ‘Burhan, the Son of Kashmir’ was released on the website by the same name. Rana Abrar, a Pakistan based director has directed the movie featuring animated Burhan Wani as the protagonist. He said that the team would go on and complete the film “as soon as possible”. This is not the first time that Pakistan has picked Burhan for attracting attention towards Kashmir. In 2016, on the eve of Pakistans 70th Independence Day, state-run railways ran a special train named ‘Aazadi Train’ with a picture of Burhan Wani on its outer walls. Later that year, a song directed, composed and sung by a Pakistani Rap singer Raja became popular among Kashmiri youth. The song has gained two million views on YouTube. Burhan became popular after he started posting his pictures on social media. He was killed by Indian armed forces on July 8, 2016. Following his killing protests erupted across Kashmir leaving over hundred people dead and over a thousand with pellet injuries. His death brought Kashmir to a stand-still for nearly six months, making it longest cycle of protests-curfew-killings. Later, the then Prime Minister Nawaz Sharief mentioned him in his speech to UN General Assembly forgetting even the top Hurriyat leaders.